I didn't see you there because I was too busy doing a ridiculous totally coordinated, award-worthy celebratory dance. My front door? Painted. 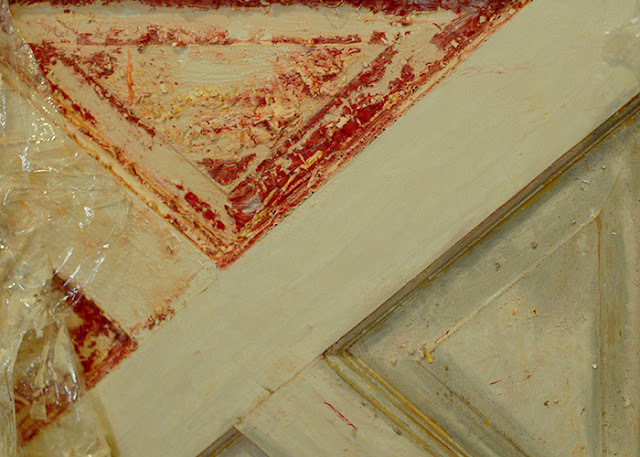 Boo-yah, take that 50 years of paint. Plastic wrap -- this kept the stripper's moisture in and made a big difference. Plastic putty knife -- I could really scrape at odd angles and dig in without gouging the wood. Metal putty knife -- still helpful for totally flat scraping of any stubborn bits (there were a few). Small wire brushes -- a friend from college suggested these (thanks, Shawn!) and they saved my life when it came time to work in the detailed trim regions. I bought a pack of three at Lowe's, saved them for when I needed them and soaked them in warm water to help get rid of the messy paint. After a few hours in plastic wrap the paint scraped right off. Honestly, it was disgusting. It was rubbery on top but the bottom layer was super wet and gloppy and it felt like cleaning off thick wallpaper paste. It was a big mess. It got worse before it got better. I may have cried a bit. After scraping all the paint off I went back over it and scrubbed the remaining residue off with hot water and some cleaner. I didn't get it down to the bare wood but it was one level up and it was flat and smooth and perfect for what I wanted to do! 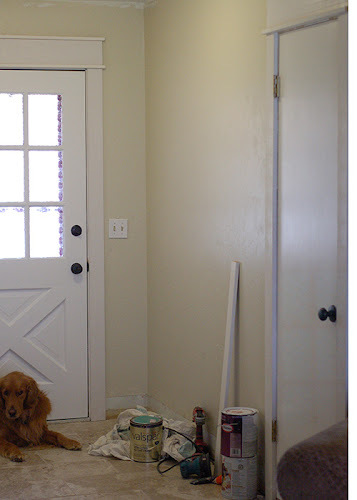 I primed and painted that sucker before I lost my door mojo. 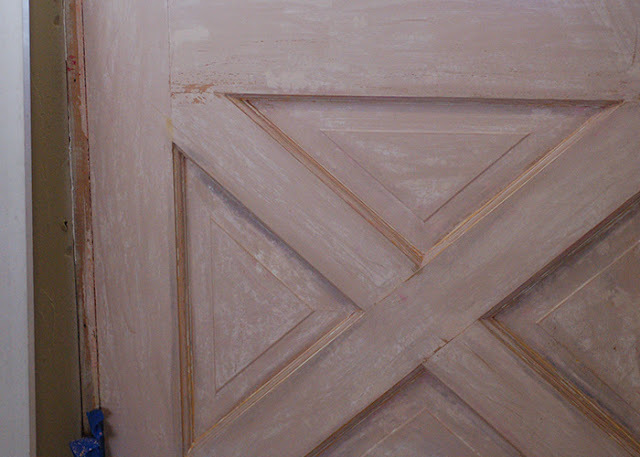 Then I got excited at the progress and added some trim around the doors. My front door has been without trim for years (I mean years in the literal sense. Years, people!! I get distracted so easily.) so I've been spending the last day or two just standing in my entry, looking at it and smiling. I can almost convince myself that the entry is almost done... I mean, it looks so much better already... even without caulk and paint on the trim. Or baseboard. Okay, I may have been getting ahead of myself there. I've got plenty of work to do still. On a side note, tomorrow I take Maggie back into the vet to get her stitches removed. I didn't really talk about it but she had a massive tumor on the outside of her cheek that we had removed a couple weeks ago. It was really bothering her and we still don't know if it was benign or if she's more seriously ill.
She may be a giant PITA but that doesn't mean she has permission to get cancer -- so I'd love your healthy puppy thoughts. You did a much more thorough job than I would have...in other words, your paint is going to last for years!! Beautiful work and I love the trim!! The door looks great! John and I have doors to do on our house too... most notably, our HIDEOUS BRIGHT ORANGE FRONT DOOR. We were planning on sanding the heck out of the doors, as some of them are pretty badly weathered but we can't afford to replace them right now. May have to try some of that Citristrip! Isn't your pup a bit young for The Big C? Our Golden is 10 now, and we're living in constant fear of cancer. 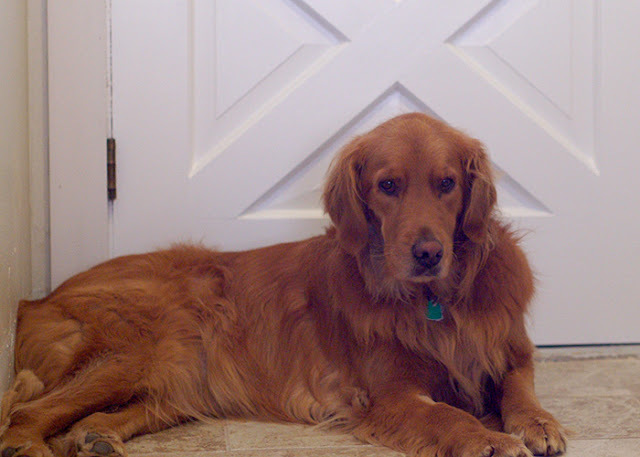 Every new lump, and there are lots as Goldens are famous for getting fatty tumors, gives us an absolute heart attack. Sending you and your Miss Maggie lots and lots of positive vibes! Anna, holy cow it looks amazing now. Great work! Love the door and your beautiful doggie. Sending positive thoughts to the giant PITA. I have a tiny little dachshund and she's still a giant PITA. Good to know mine's not the only one. Love the door and sending LOTS AND LOTS of happy thoughts towards Maggie. Hope it turns out benign, my golden passed away when he was 7 (1 week after sophie was born) from a freak stroke- at least thats what the vet thinks he had, still not totally over that. 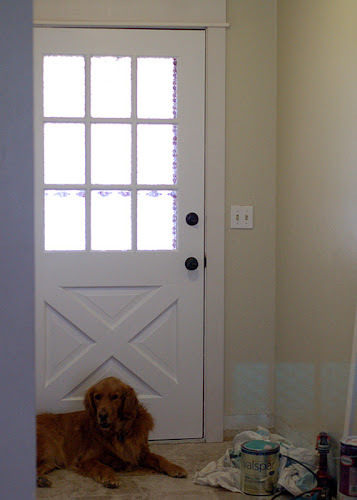 Aww, sending positive thoughts to Maggie that she'll be ok. Front door looks great. Way to keep at it.